Jon Martindale has been a feature tech writer for more than 10 years. He's written for publications such as Digital Trends, KitGuru, and ITProPortal. Modern phones have more storage than ever and there are multiple ways to expand it further. While most might opt for adding an SD card to their mobile device, a flash drive for your Android phone can does have its advantages. Why Use An Android Flash Drive? Having a phone flash drive might seem a little clunky compared to greater on board storage or using a cloud service, but think of it like an external drive for your PC or laptop. It's entirely separate from your device, so if your mobile handset is damaged or lost, your data is still safely backed up. You also have complete control over its location and distribution. It's safe as long as you keep it safe, which gives you the power over how protected the stored data is. 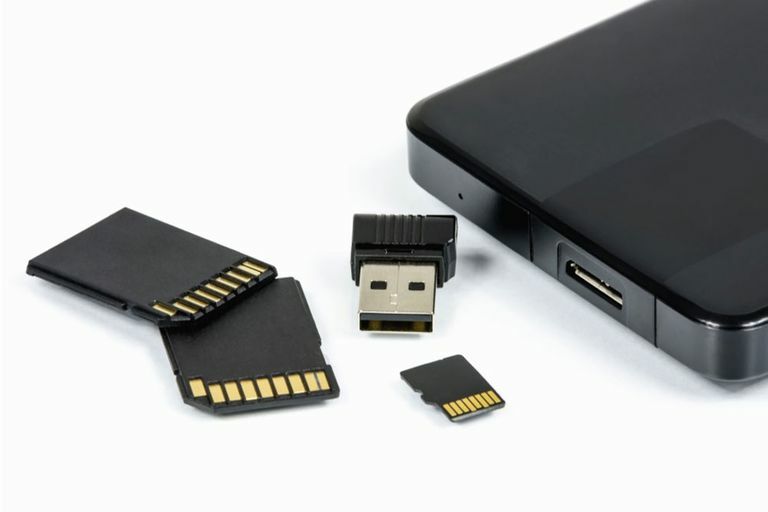 Better yet, with the larger size of a connected flash drive, you can increase the storage space of your mobile phone indefinitely, adding hundreds upon hundreds of gigabytes if you use more than one device, or decide to spend a lot on a big one. The only problem with using a USB drive connected to your Android device is smartphones don't typically have a compatible connector. Most flash drives have USB type A ports, which makes them great for connecting to legacy PCs and laptops, but useless (at least initially) for hooking them up to your smartphone. But that's not always the case. The easiest way to connect a USB drive to your Android smartphone is to buy one with the right USB connector built into it, then plug it into your device. Check what port your phone has. Most modern devices have a singular USB port for charging and data transfer. Some recent devices have USB-C, while older devices have microUSB. When you know what you need, go to a general retail website like Amazon and search for your USB standard followed by "Flash," for example, "microUSB flash." Compatibility: Make sure the flash drive has your smartphone's USB connector on it. If your phone uses microUSB, you want the flash drive to have the correct male connector on it. If your device is USB-C, you want to make sure it has a male version of the connector instead. Speed: microUSB and USB-C are important for compatibility, but they don't necessarily guarantee high speed. You want USB 3.0 at the least, though USB 3.1 is faster still. Faster speeds mean less waiting around when transferring large files between your phone and the flash drive. Versatility: If you want to only connect the flash drive to your smartphone, then only one connector is needed. However, there are some with microUSB/USB-C connectors and a USB type A connector on the other end, making it easy to connect the flash drive to your PC or laptop for transferring data between both devices. Storage size: If you only want to back up a few images, videos, or documents, 32GB is likely more than enough additional storage. However, if you want to store or transfer entire phones' worth of data at a time and expect to do it often, you may want to opt for a larger 128GB or even 256GB flash drive. Some options extend up to a terabyte, but they get very expensive. If the particular flash drive you want doesn't have the connector you want, you aren't out of luck just yet. There are adapters you can use which act as intermediaries between the two USB standards. They come in the form of cables and small adapters, which are little more than USB headers on each end. The same kind of purchasing decisions factor in with adapters as they do with the drives. However, there is one more aspect to consider; male and female adapter headers need to be correct in order to connect to your device and flash drive. You’ll likely want a male microUSB/USB-C connector to plug in to your smartphone and a female USB type-A for your flash drive, but make sure it’s correct for your particular hardware before buying. As with the USB flash drives, you want to consider the right speed of the adaptor. Many are USB 2.0 only, which can severely impact your data transfer speeds.